The House Hotel is exactly that- your home away from home. That is if you live in the home of the architects that designed the Dolmabahce Palace. The hotel itself is GORGEOUS! If you want a huge sprawling hotel, this is not the place for you. This was literally the house of a famous architectural family and you can see it in all the detailing of the hotel and rooms. 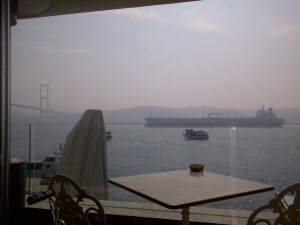 Due to some noise that was NOT under the control of the hotel, we were upgraded to the Bosphorus Suite. And what an upgrade it was. 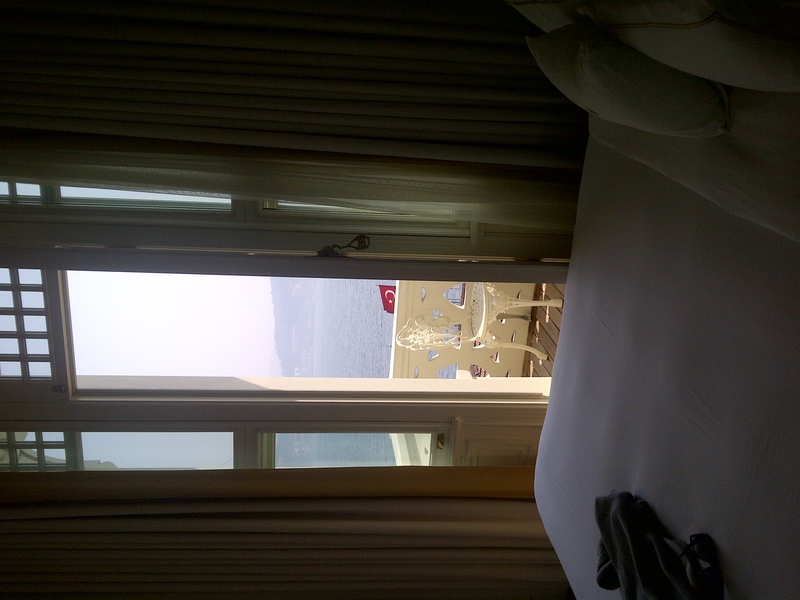 This suite has 2 balconies, both which look out onto the Bosphorus. The downside is that the cute little balcony with a small table and chairs and the breathtaking views makes it VERY hard to want to leave the room. We actually nixed a ferry tour so that we could just relax on the balcony. Besides the beautiful detailing in the rooms, the interior decorating is also very charming. 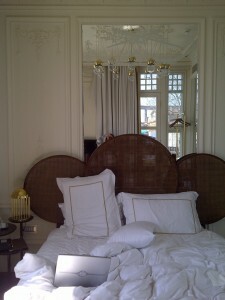 My favorite was the bedside lamp that looks like a golden birdcage. It’s details like this that make me fall in love with certain hotels. And my favorite part of the rooms- L’Occitane bath products. Sold! That’s when I knew everything in this hotel was luxurious. In addition, they provide complimentary bottles of water and my favorite, complimentary brunch. As for location, it couldn’t be any better. You have the most amazing view of the Bosphorus Bridge. Watching it change colors at night was amazing. 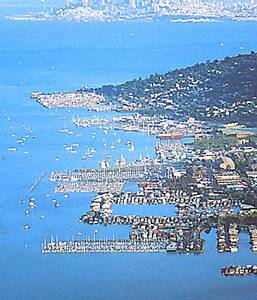 You are also in walking distance of tons of restaurants, shops and ferry tours. If you are looking to go to do touristy stuff, it is an easy 30 min walk (or quick bus ride) to the Dolmabahce Palace or the Metro which takes you right to old town. Super easy. 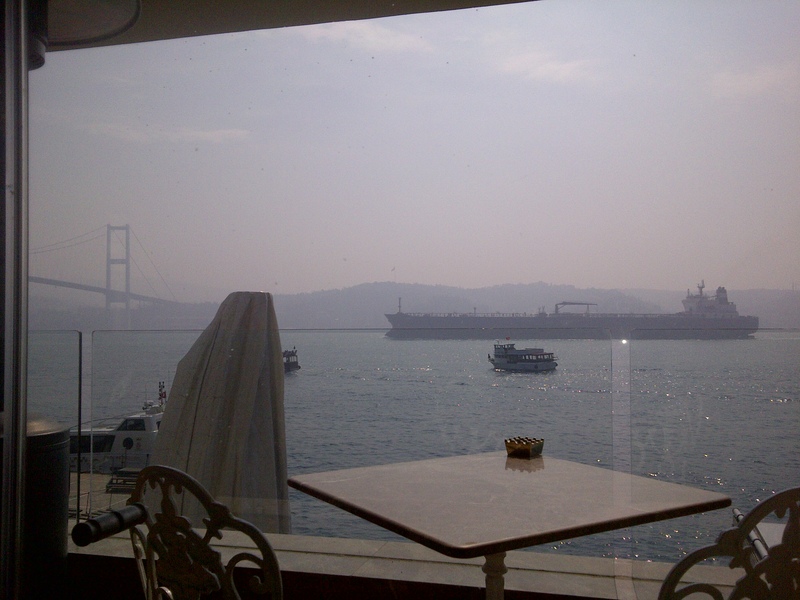 You are also about a 45 min walk to Bebek which is an adorable little waterfront town to the north. And I had to save the best part for last. What really made The House such a memorable stay was the service. Bahar, the manager, came to greet us when we were done with breakfast. She introduced herself and apologized for the noise (which wasn’t their fault). She told us she was changing our room so we were farther away from the noise. She also sent us a bottle of wine and made sure everything was perfect from then on out. Her and her staff were all so helpful and friendly, we were sad to go to the next hotel. She was so great that When we had a terrible experience at the next hotel (Le Meridien Etiler), I emailed her and she was able to get us a room at her sister hotel, The House Hotel Nisantasi. Brunch was included in the rate and it was delicious. Besides the normal pastries, cheese, toast, cereal etc, you could also order hot items like eggs or omelets from a special menu. The view from the library, where brunch is held, is the perfect place to start the day. 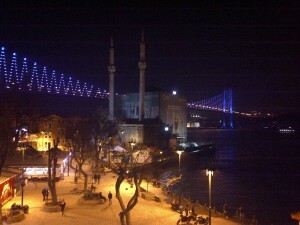 I can’t wait to go back to Istanbul and even more, I can’t wait to stay at The House Hotel Bosphorus and see Bahar! Here is a great deal when you want a quick, cheap getaway to Vegas or Orlando. For $125, you and a companion can fly out to either city and includes a 2 night stay at a hotel. How can you beat that deal??! Wait, it also includes a $50 gift card to restaurant.com. Click here to get one now before it sells out! knowledge with as many people as I can. When someone tries to defend the homosexual lifestyle, for example, I simply remind them that Leviticus 18:22 clearly states it to be an abomination. End of debate. pleasing odor for the Lord – Lev.1:9. The problem is my neighbors. female, provided they are purchased from neighboring nations. A friend of mine claims that this applies to Mexicans, but not Canadians. Can you clarify? Why can’t I own Canadians? homosexuality. I don’t agree. Can you settle this? glasses. Does my vision have to be 20/20, or is there some wiggle room here? me unclean, but may I still play football if I wear gloves? A Bay Area enclave that put mellow on the map keeps its funky vibe. Plum District has another deal for the scrumptious Rustic Bakery. With their new location at Marin Mart, it is even easier to get your hands on their yummy sandwiches, salads, buttery croissants and addicting cookies. Right now you can get a card with 10 $5 off punches for $25. Use the code VISA10 and your Visa card to get another 10% off. Click here to get the deal! Can a Travel Agent Actually Save You Money? This question, posed by The New York Times, got us thinking. According to the piece, nearly one in three leisure travel agencies is hiring, and in 2011 travel agencies experienced a second consecutive year of growth; in fact, their bookings accounted for a third of the $284 billion U.S. travel market. Silly us, we thought travel agents had become passé. But if the travel agent business is thriving, we started wondering—is there something to this? Could using an old-school travel agent actually save us money on travel? To find out, we consulted Barbara Vong, a travel agent withWright Travel Agency, the 2011 winner of the Best of the Best Globe Award from Travel Impressions. The first thing we learned? Travel agents usually don’t charge customers for their services! Their payment actually comes through the hotels and wholesalers, meaning that we can simply tap into a free service. That also means using a travel agent should never be more expensive than booking by yourself online … and these are experts well-versed in where to find the best deals. If you’re planning to travel somewhere out of the country, and you’ve never been there before, it might be a good idea to go through a travel agent. When you use an agent to book international travel, you’ll be able to ask a million questions, says Vong, and your agent will be sure to gather all the information you’ll need to make sure you’re traveling safely. Travel agents aren’t able to use your points or rewards card miles to book a flight or hotel for you—you’ll have to book on your own if you’d like to use them. “If you’re booking on your own, though, sites like Expedia or Orbitz, they usually offer a place for you to input your rewards information,” says Vong. Go ahead and book a travel deal that you find on a site like LivingSocial, Groupon orTravelzoo. Just remember that you’ll need to be flexible with the travel dates (most deals are offered for off-peak times, like travel on a weekday only, or for a Sunday night at a hotel), and be wary of expiration dates. If you can, avoid flying out on a Thursday or Friday, or flying back on a Sunday, when Vong says flights tend to be the most expensive. “It’s hard to say exactly how much a traveler could save, as it depends on the specific flight and how much space is available on it, but you could find yourself saving up to $50 or more for longer flights,” says Vong. We’ll cover this and more ways to nab the absolute cheapest airfare in our upcoming story on when to buy plane tickets for just about everything–so keep your eyes out! Set up transportation from the airport to your hotel through a shuttle or van service online prior to arriving at your destination. Local taxis in some countries have been known to charge more to foreigners traveling to and from airports. If you’re working with a travel agent, she should always be able to book transportation for you from the airport. If you’re booking on your own, try calling your airline for suggestions, or searching on the tourism website for the place where you’re going (most major tourist cities have a tourism website.) If you’re booking a tour on your vacation, most tour operators also offer transfers with the purchase of certain products, says Vong. The Go City Card is available in nine U.S. cities (including Boston, Chicago, New York, Orlando and more), and it allows you to pick and choose which sightseeing you want to do and to buy those activities as a bundle, which will be much cheaper than buying them individually. If you’re traveling within the U.S., sign yourself up for emails from deal sites likeGroupon, Livingsocial and Bloomspot from the city you’re traveling to for potential discounts. In other words, if you live in Chicago but are traveling to San Francisco, subscribe to the San Fran deal sites shortly before your trip–you can always unsubscribe later. If you’ll be traveling to a country where you’ll need a different currency, Vong suggests exchanging money at your hotel. “They usually have the best rates, they don’t charge a fee and you can put any extra money you don’t need back in the safe deposit box in your room as soon as you get it,” she says. Tell us—how do you save money on travel? This lovely review comes courtesy of Marilyn Hagerty, a writer for the Grand Forks Herald. As I have yet to try one, I will post her review for all of you wondering what Olive Garden is really all about. After a lengthy wait for Olive Garden to open in Grand Forks, the lines were long in February. The novelty is slowly wearing off, but the steady following attests the warm welcome. My first visit to Olive Garden was during midafternoon, so I could be sure to get in. After a late breakfast, I figured a late lunch would be fashionable. The place is impressive. It’s fashioned in Tuscan farmhouse style with a welcoming entryway. There is seating for those who are waiting. My booth was near the kitchen, and I watched the waiters in white shirts, ties, black trousers and aprons adorned with gold-colored towels. They were busy at midday, punching in orders and carrying out bread and pasta. It had been a few years since I ate at the older Olive Garden in Fargo, so I studied the two manageable menus offering appetizers, soups and salads, grilled sandwiches, pizza, classic dishes, chicken and seafood and filled pastas. At length, I asked my server what she would recommend. She suggested chicken Alfredo, and I went with that. Instead of the raspberry lemonade she suggested, I drank water. She first brought me the familiar Olive Garden salad bowl with crisp greens, peppers, onion rings and yes — several black olives. Along with it came a plate with two long, warm breadsticks. The chicken Alfredo ($10.95) was warm and comforting on a cold day. The portion was generous. My server was ready with Parmesan cheese. As I ate, I noticed the vases and planters with permanent flower displays on the ledges. There are several dining areas with arched doorways. And there is a fireplace that adds warmth to the decor. Olive Garden has an attractive bar area to the right of the entryway. The restaurant has a full liquor license and a wine list offering a wide selection to complement Italian meals. Nonalcoholic beverages include coolers, specialty coffees and hot teas. On a hot summer day, I will try the raspberry lemonade that was recommended. There’s a homemade soup, salad and breadstick lunch available until 4 p.m. daily for $6.95. An olive branch on menu items signified low-fat entrees. There is a Garden Fare Nutrition Guide available for customers seeking gluten-free food. And for those with food allergies, Olive Garden has an Allergen Information Guide. All in all, it is the largest and most beautiful restaurant now operating in Grand Forks. It attracts visitors from out of town as well as people who live here. Olive Garden is part of the Darden chain of restaurants that also operates Red Lobster. There are about 700 restaurants, including four Olive Gardens in North Dakota’s major cities. Olive Garden has gained a following since 1982 with its ample portions and relaxed ambience. It’s known for its classic lasagna, fettuccine Alfredo and chicken Parmigiana. Yay it’s back! Another Sol Food deal! Right now you can get their Early Bird deal with $10 worth of food for $5 or their Night Owl deal of $10 for $20 worth of food. Click here to get this deal before it sells out! Vouchers are good at either of their Lincoln Street locations. If you are considering of going to the Cancun/Riviera Maya area in the near future, here are some tips from a recent client. She and her husband started in Cancun and made their way down to Tulum during a relaxing 10 day trip. Westin Lagunamar/Cancun – I loved the hotel! The room was beautiful and big. We were in the new section, which still has some construction going on but it was pretty quiet for the most part. I loved the bathroom, the soaking tub has a sliding wall that separates the bathroom and bedroom so when you slid it open you had a view of the bedroom and the ocean!! The staff were incredibly helpful and pleasant. Downside, the food was so-so. Mahekal Beach Resort/Playa del Carmen – Great place! Room and bathroom were nice and spacious, although limited furniture. The porch was nice with 2 hammocks. Would definitely recommend requesting the top unit if staying in the 2 unit bungalows, unless you have kids and do not want to deal with steps. They have over 100 rooms but they did a great job spreading out the bungalows so the resort did not feel big or cramped. Food was average at best. Breakfast was our best bet. The location of the hotel was also nice and in a cute little neighborhood which seems up and coming. We could easily walk-down to 5th street. I would definitely recommend this place for families and for weddings. Not sure how they do weddings there but it would be a great hotel for guest accommodations! El Pez/Tulum – Best place!! Love, love, love the hotel and town!! All 4 of us ranked this as # 1 and cannot wait to go back. 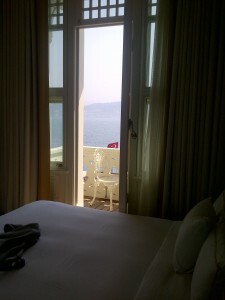 The beach front rooms were spectacular, killer views. 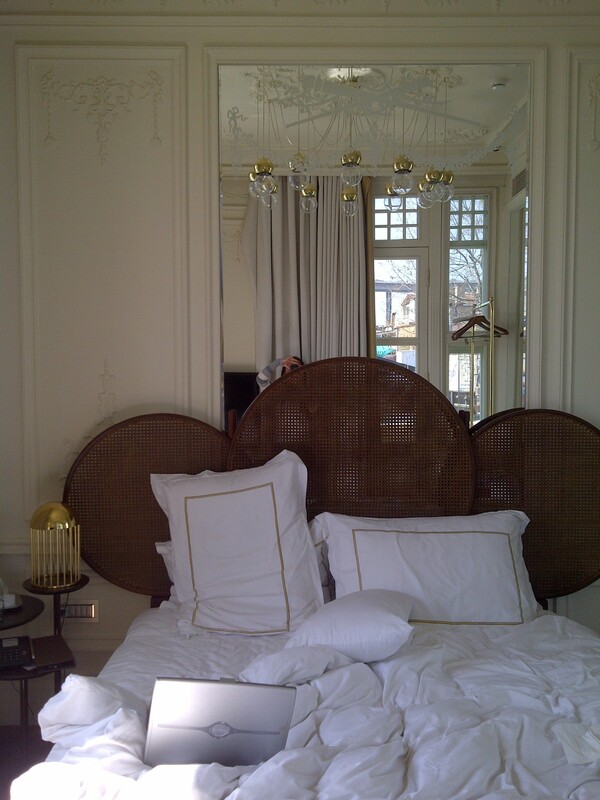 The rooms were nice too. Note, the bathroom is part of the room which did not bother us but may bother others. Next door was the SandBar which served breakfast, lunch and dinner. Food was fantastic – basic but delicious. Dinner was BBQ! No shoes required since it was on the beach. Staff were wonderful too. Another great restaurant is Mateo’s, located a block away. Best tacos ever! Great vibe too!! I’m not sure El Pez does weddings but it would be an incredible place to have one. One possible downside is the area was breezy, not sure if this is common for Tulum. I know its popular with kiteboarders so it may be.